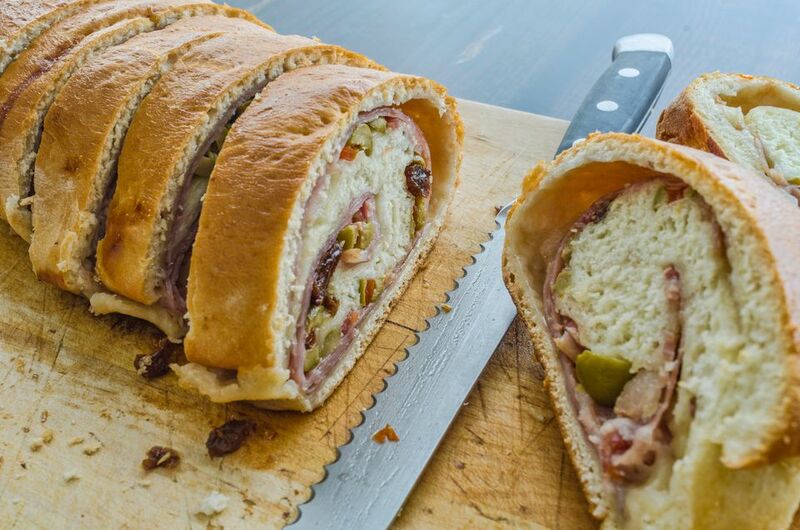 In Venezuela, this slightly sweet bread stuffed with ham, olives, and raisins is especially popular at Christmas time. The bread dough is rolled up around the fillings into a log, similar to the way cinnamon rolls are made. Once baked, the bread can be sliced into attractive spirals. Pan de jamón makes a nice meal paired with soup and a salad. Use green or black olives (or both) according to your preference, thinly sliced deli ham, and raisins for the traditional filing. Sliced cheese would make a nice addition as well. Place the warm water in the bowl of a stand mixer. Sprinkle the yeast over the water and let stand for 5 minutes. Add 1 cup of the flour, the butter, and the egg, and mix well using the dough hook attachment. Add the softened butter and another cup of flour and mix well. Add remaining ingredients and knead until smooth, adding a bit of extra flour if the dough is too sticky. When well kneaded, the dough should be soft, shiny, and smooth. Place the dough in an oiled bowl. Cover with plastic wrap, set in a warm location, and let rise until doubled in bulk (about an hour and a half). Divide the dough in half. On a lightly floured surface, roll half of the dough into a large rectangle (about 10 x 12 inches). Brush the dough with 1 tablespoon of the melted butter. Place half of the ham slices over the dough, leaving a 1-inch border all around. Sprinkle half of the raisins and half of the olives around over the ham. Tightly roll up the dough lengthwise (starting with the long edge), sealing the last part of the dough to the roll with some water. Place roll, seam side down, on a parchment-lined baking sheet, and tuck the ends under slightly. Repeat with the other half of dough. Mix the egg yolk with a teaspoon of sugar and brush the mixture onto the rolls with a pastry brush. Lightly cover the rolls with oiled plastic wrap and let rise in a warm place for about an hour. Bake bread at 350 F for 30 to 40 minutes, until golden brown. Remove from oven, and let it cool slightly before slicing. You now have a completed pan de jamon.